Other Products by Giant Sports. Search other Testosterone Supplements products. Giant Sports Novedex Black provides a multi-functional approach to boost natural testosterone levels. 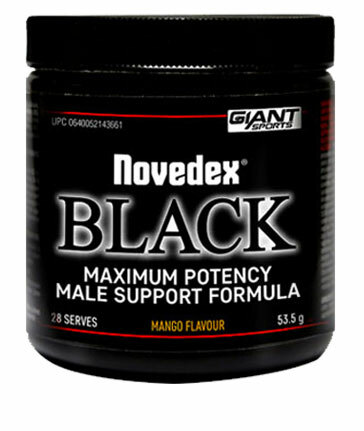 Novedex Black is a high potency formula to support male hormone production utilising a contemporary list of ingredients. Maca (Lipidium meyenii) has been clinically proven to enhance libido and aids hormone homeostasis, whilst the standardised extract of Trigella foenum (Fenugreek) increases natural testosterone levels and supports lean muscle gains. Giant Sports Novedex Black also contains Withania somnifera, which showed a 40% increase in testosterone in a study of 75 men. Several ingredients in Novedex Black such as Garcinia mangostana have powerful anti-oestrogenic properties which are extremely important in preventing male hormone conversion and increasing testosterone. Giant Sports Novedex Black is a research driven formula to support all areas of mens health including increasing libido, increasing male hormone production, reducing oestrogen, supporting lean muscle gains and reducing cortisol levels just to name a few. Mix 1 serving (1 scoop) with 200ml of water in the morning 30-45 minutes after breakfast. Take 1 scoop per day. INGREDIENTS: Citric Acid, Malic Acid, Lepidium meyenii (Maca containing Macrolides), Trigonella feonum-graecum (Fenugreek containing Furostanol Glycosides), Flavours, Bee Propolis (containing carreic Acid Phenethyl Ester), Garcinia mangostana (Mangosteen containing Xanthones), Vits vinifera (Grape Seed containing Stilbenoids), Withania somnifera (Ashwagahdha containing Withanolides), Anti-caking Agent (551), Sweeterners (955, 950). Contains Propolis which can cause severe allergic reactions. May be present: milk, eggs, soy, tree nuts, peanuts, wheat, fish, crustacea and shellfish.